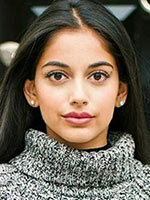 Banita Sandu was born to a Sikh family in London. She has graduated from King's College London She has appeared in various Indian TV commercial in Vodafone, Double mint Chewing Gum etc. She also worked as a child artist in different TV shows and films when she was barely 11 years of age, however, she has now transformed into a full-time model and actress. She debuted in Bollywood with 2018 movie October.